Is there some special video game issue of The Onion currently in print? Because not only did the humor publication skewer game violence this week, it also poked at Super Mario Bros. and, now, Punch-Out!!. We won't spoil the thing for you (too much), but The Onion Sports writes of Punched Out!! 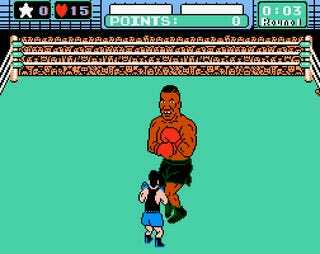 : The Mike Tyson Story, a verbal recounting of the events of Mike Tyson's Punch-Out! !, "reported" to debut at the 2009 SXSW Film Festival. Favorite bits include: "Tyson himself admits that it was his incessant blinking-the only time he showed any weakness in the ring-that ultimately lead to his demise" and "the infamous 'password' scandal, U.S. Supreme Court case number 007-373-5963, in which Mac was accused of unfairly skipping all the boxers and going directly to Tyson." Of course, ripped from its context, it's not nearly as amusing and flowingly inside-joke filled.